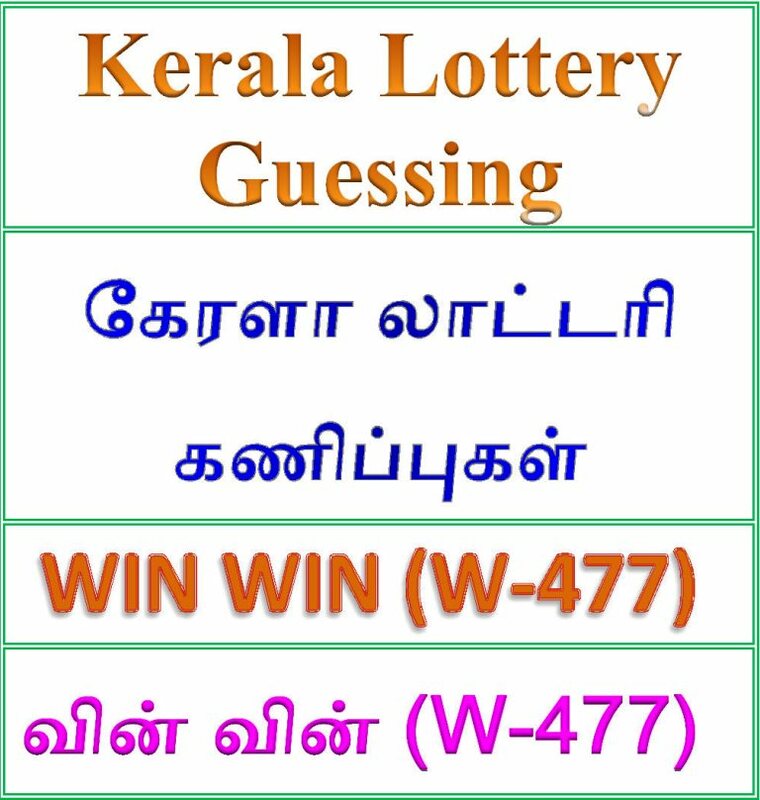 Kerala lottery guessing / predictions for WIN WIN W-477 dated 10.09.2018. Winning number predictions of weekly lottery WIN WIN W-477 on 10 September 2018. Best possible winning numbers published below. These guessing number are just our and our visitors predictions.People who are interested in Kerala lotteries use may ways to forecast the winning numbers with many methods of speculations. 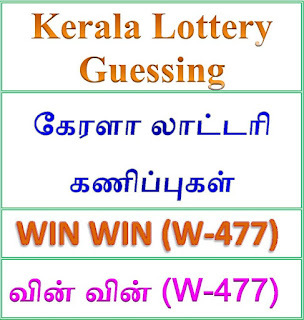 These are not any leaked Kerala lottery result or confirmed Kerala lottery result.Predictions of WIN WIN W-477 lottery is only a speculative game for fun and increase the curiosity on the draw of WIN WIN W-477 Lottery held on 10.09.2018. 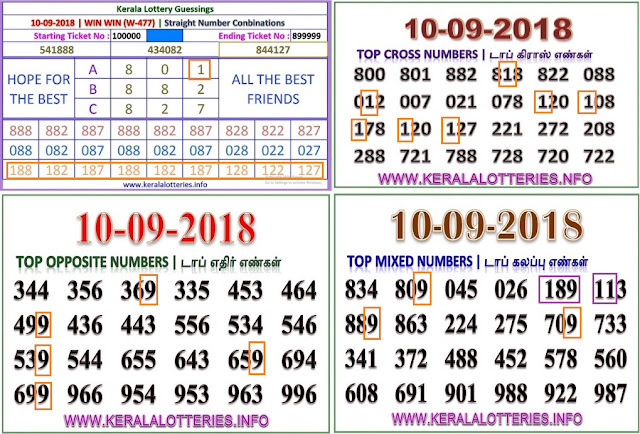 Kerala Lottery Guessing | 10.09.2018 | "KK"
Kerala Lottery Guessing | 10.09.2018 | "Vinoth Namakkal"
Kerala Lottery Guessing | 10.09.2018 | "Rajasegar"
9/9/2018 22:12:20 Saleem Nilambur A. 3. 9/10/2018 12:15:44 gk aran 343.433.777.110. Winner of Kerala Lottery Guessing will be announced here after the original result is released. 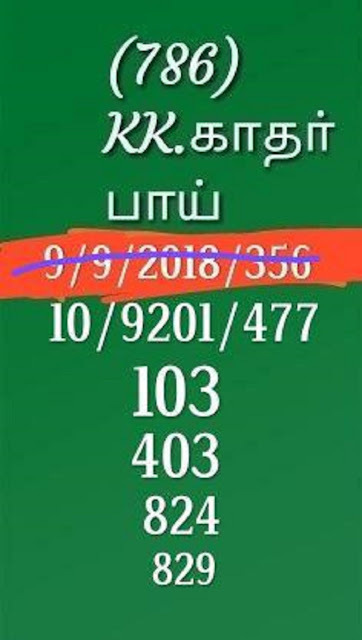 உங்களுக்கு தினசரி கணிப்பு தரமுடியுமென்றால் எங்களை தொடர்பு கொள்ளவும். 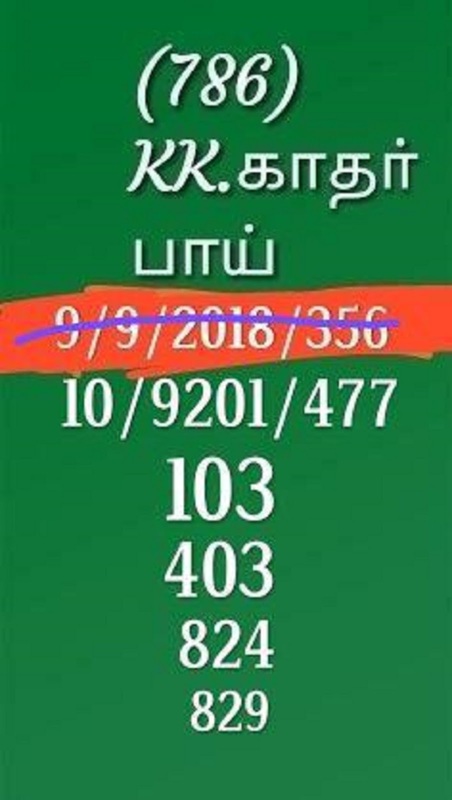 உங்கள் கணிப்புகள் தனி பக்கத்தில் வெளியிடப்படும். ദിവസേന ഗസ്സിങ് തരാൻ തയ്യാറുള്ളവരുടെ പ്രവചനങ്ങൾ പ്രത്യേക പേജുകളിൽ പ്രസിദ്ധികരിക്കുന്നതാണ്.